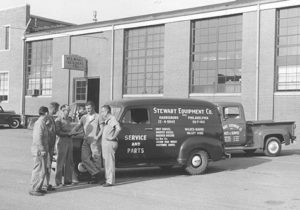 About Stewart-Amos Sweeper Company - Stewart-Amos Sweeper Co.
Stewart-Amos Equipment Co. was founded in 1938 as a mineral processing equipment supplier. In 1947, we began distributing road building equipment including early street sweepers. To minimize maintenance costs of our growing rental fleet, we decided to design and build our own street sweeper. Our first rental sweeper was designed to provide maximum up-time and low operating costs, while being simple and easy to use, troubleshoot, and maintain. This original effectively simple design has been the blueprint for all subsequent Stewart-Amos models and enhancements. To us, effectively simple means using parts and system components that are: uncomplicated; extremely reliable; easily sourced and affordable to fix repair/replace if worn out or damaged. 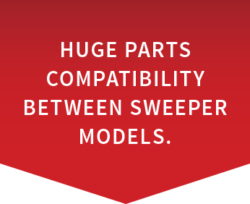 At Stewart-Amos Sweeper Co., we strive to build effectively simple into every new product and upgrade we offer. We manufacture 6 Starfire mechanical broom units in 4, 4.5, 5 and 6 yd3 hopper capacities – single and twin engines. We also manufacture 3 mid-sized Galaxy regenerative air street sweepers. Five models are mounted on non-CDL chassis. This makes them highly maneuverable and ideal for non-professional drivers. These include the: Galaxy R-4, R-6, R-6XL and Starfire S-4c and S-4XL. The Starfire S-4c is mounted on an extremely tight 16’9’ turning cab-over chassis that is extremely fuel efficient and quiet. It provides unmatched maneuverability similar to 3-wheel sweepers, yet travels at highway speeds between job-sites. This makes it perfect for cleaning tighter, more confined areas like cul-de-sacs, narrow tree lined streets and alleyways. Stewart-Amos Sweeper Co. is a division of Stewart-Amos Equipment Co., the holder of our small business GSA contract - GS-30F-021AA. Our products are extremely effective for use on military bases, airfields, federal administrative campuses, ports, warehousing, national parks, and disaster relief projects. They clean all types of debris including: fine dust, road and construction debris, heavy sand and millings, crowd debris, rock and stone. Stewart-Amos offers a full line of mechanical broom and regenerative air street sweepers, all based on one simple, time proven design. This means they share large percentage parts compatibility between models. This is one reason why we can provide upwards of 95% same day parts shipments (if orders received before 1 PM eastern). However, many customers find it just as easy to access most parts locally. Whatever your sweeping needs, chances are Stewart-Amos Sweeper Co. has the right solution to get your job done. We invite you to learn more by contacting us at 800.482.2302.